Welcome to the second entry in March’s Mini Mod-Ster Contest. One delectable Mini Mod will be published in every Email Alert in March. At the end of the month we’ll hold a reader vote to determine March’s winner. For information about the Mod-Ster Contest, including how to enter, click here. 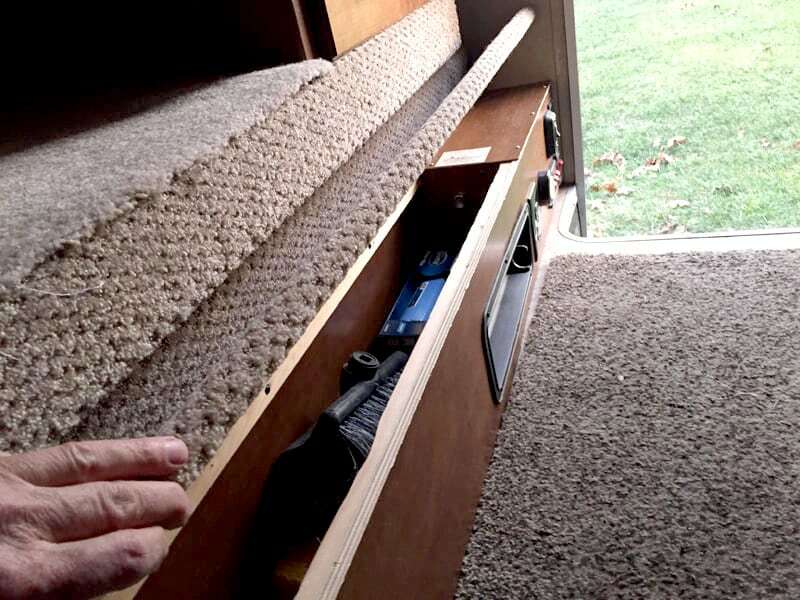 In the Lance 855S, the narrow step up into the dinette sitting area has a lift-up storage area underneath it. The battery disconnect switch is also located under this step. Access into this area was difficult since the lid was held in place by compression and gravity. To make it easier to lift the dinette step, I installed a piano-type hinge. Now it can simply be accessed by lifting it up. It is much better than the stock set-up. It took me one hour to complete this modification and cost me $10. In my opinion, the skill level of this modification is easy.